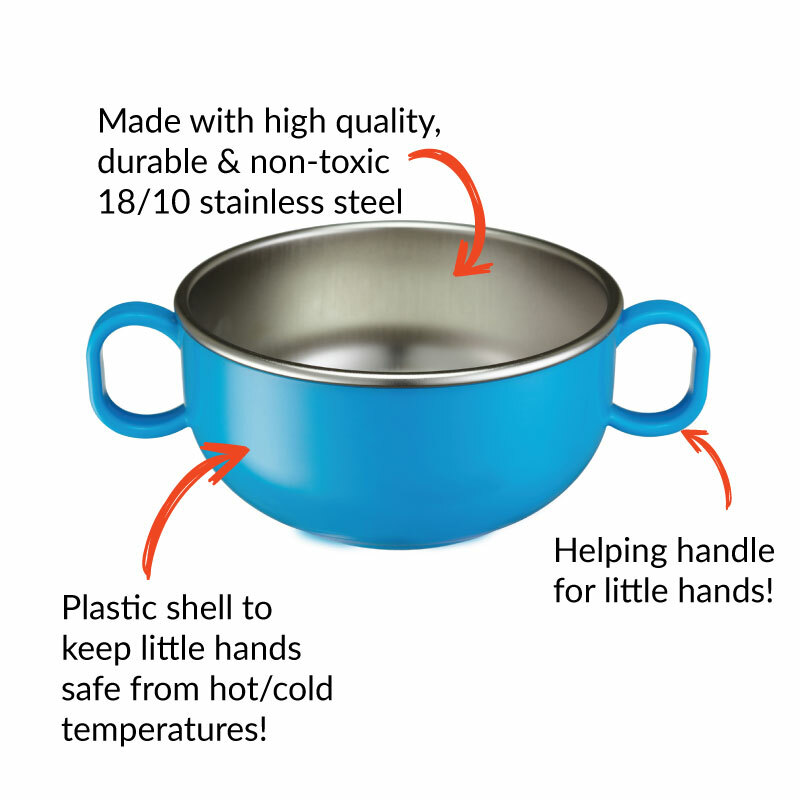 Our Din Din Smart™ Stainless Steel Starter Bowl was specially designed with little hands in mind. It features a double lined wall and a plastic shell to help protect your child’s hands from hot or cold temperatures. The kid friendly Starter Bowl is perfectly sized for first foods and includes two easy-to-grip side handles. Our Stainless Steel bowl is a safer choice for eating hot foods because it is break resistant, does not melt, does not rust, and super easy to clean. Bonus: it doubles as a great dessert bowl for ice cream too! Innobaby has a complete line of non-toxic stainless feeding products and dishes for your baby or child. Shop all of our Din Din Smart stainless steel products including stainless steel cups, stainless steel sectional plates and stainless steel silverware. Made from high quality, durable, non-toxic Type 304 (18/10 stainless steel). Don’t forget to check out the matching Din Din Stainless products, like our sectional Bus Platters or Cups! SAFE FOR YOUR CHILD - The ORIGINAL Innobaby stainless steel dinnerware bowl is made of the highest quality, environmentally friendly, food grade 304 stainless steel (18/10 stainless) in South Korea. This product is non-toxic, BPA free, Phthalate free, PVC free and lead free. 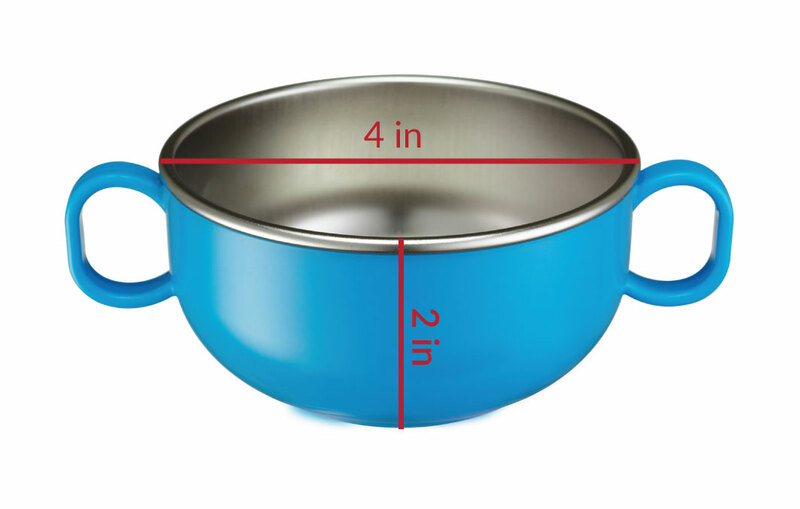 DOUBLE LINED BOWL KEEPS FOOD WARMER / COLDER LONGER AND PROTECTS LITTLE HANDS – the hard plastic outer shell insulates and keeps food at the desired temperature longer while protecting your child’s hands from extreme temperatures. MAKES MEALTIME FUN - Our kid-friendly colorful design makes meal & snack times fun. The dual handle bowl design allows little hands to grip with 2 HANDS leading to independent self-feeding with less mess. DURABLE AND ECO FRIENDLY – Our stainless steel kids cups, bowls, plates, forks and spoons will not stain, harbor orders, or rust. Rid yourself and the environment of plastic and paper plates for good – opt for stainless steel. Stainless steel keeps food warmer/colder for longer and plastic shell protects little hands. Chill for 5-10 minutes in the freezer before serving cool snacks. Safe for warm or cold beverages. Stain, rust, and odor resistant. Hand wash with gentle soap. Wash before first use. Type 304, 18/10 stainless steel. Handwashing is recommended. Not intended for use in microwave ovens.